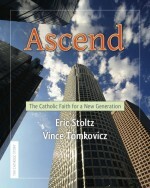 The Catholic Story » Blog Archive » Join Us for the Launch of Ascend! « Is the Vatican Creating an Anglican Petting Zoo? Join Us for the Launch of Ascend! We are pleased to announce that the launch event for Ascend: The Catholic Faith for a New Generation will take place on All Saints Day, November 1, 2009, at the Cathedral of Our Lady of the Angels in Los Angeles. Deacon Vince and I will be signing book at the Cathedral Gift Shop after the 8 a.m. and 10 a.m. Masses (we will also be assisting as deacons at the 10 a.m. Mass). Do stop by if you are able! The following weekend, November 7 and 8, we will be signing books after all Masses at St. Maximilian Kolbe Church in Westlake Village, California. If you live in the northern part of Los Angeles County, Ventura County or Santa Barbara County, this is practically in your backyard! The Mass schedule at St. Maximilian is 5 p.m. Saturday; Sunday morning at 7:30, 9 and 11 a.m. and Sunday evening at 5:30 p.m.
As we add other events related to Ascend we’ll let you know! This entry was posted by Deacon Eric on Thursday, October 22nd, 2009 at 11:53 am	and is filed under Ascend, Events. You can follow any responses to this entry through the RSS 2.0 feed. You can leave a response, or trackback from your own site.